What do people in the Amazon eat? They do not have a burger joint down the block or a local supermarket. They have to catch or grow their food. The crop most widely grown is manioc, called "Yuca" by locals. (Scientific name: Manihot esculenta) Do you think yuca is yucky? It's not! One way to prepare it and it tastes like delicious potato fries (chips). Most commonly, it is made into a flour and then baked as a flat bread, which does taste rather boring and has a rubbery texture. This is the staple food of Amazon people. Manioc is the most widely eaten staple food in the Amazon. 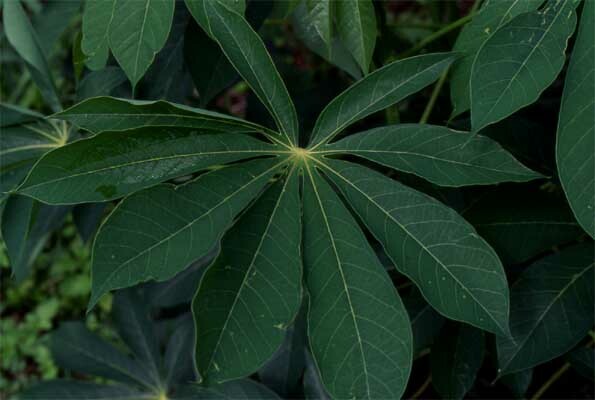 It is cultivated elsewhere in the tropics (also known as cassava). The starchy root contains poisonous cyanide compounds so needs careful preparation before being eaten. Tapioca is manioc with the fiber removed. This patch of manioc is typical of a mature crop just before harvest. 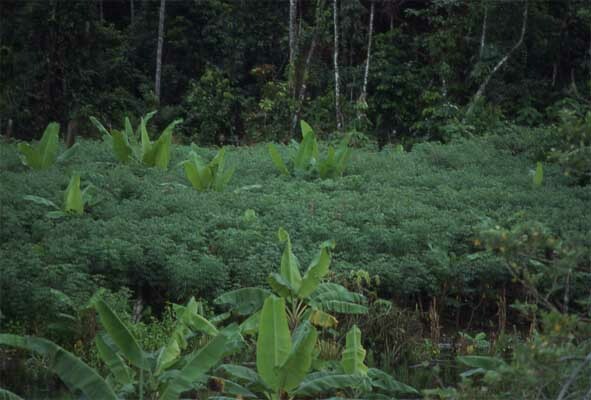 Banana plants are interspersed among the manioc, avoiding the monoculture typical of industrialized agriculture. This practice, called intercropping, may help natural enemies protect the crops in the absence of pesticides.